The Yogurt Diet is a diet that has gained notoriety in the past few years for those who were interested in shedding a few pounds and improving their general health. Before incorporating this eating plan, be sure to familiarize yourself with its basics, requirements, benefits and drawbacks. 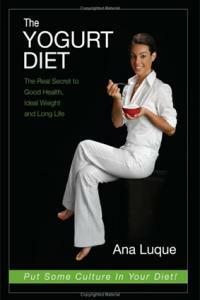 The Yogurt Diet is an eating plan created by holistic nutritionist Ana Luque. According to Luque's 2008 book The Yogurt Diet, this eating style can be helpful for those who are interested in weight loss. Unlike other weight loss diets, however, Luque's Yogurt Diet does not focus on caloric restriction. Rather, individuals are encouraged to focus on portion control by choosing servings that are no larger than the size of their palm. In an interview published in The Gloss, Luque explains that the diet requires individuals to eat four to five ounces of whole-milk yogurt with live probiotic bacteria three to four times per day, in addition to other healthful foods. Probiotics are a type of bacteria that can improve digestive function and strengthen the immune system, leading to overall improvements in general health. Healthy New Age reports that in addition to promoting weight loss, the Yogurt Diet is designed to make food choices that optimize digestion, which may aid in relieving digestive distress and in the treatment and prevention of certain chronic illness. Creative Bioscience notes that, for optimal results, dieters are encouraged to eliminate foods that may lead to inflammation in the body, like pasteurized milk, vinegar, sugar, and processed foods. Finally, aim to walk between 30 and 60 minutes each day to ensure optimal weight loss results when it comes to this diet plan, notes Luque in The Yogurt Diet. According to the Best Yogurt Makers Reviews, individuals who follow the Yogurt Diet closely may experience decreases in body weight. In fact, WebMD reports that yogurt does appear to be effective when it comes to promoting both weight loss and reductions in body fat. In addition, those who are following the Yogurt Diet may actually improve their nutritional status by potentially lowering their fat intake, increasing their protein consumption, and adding additional important vitamins and minerals to their diet that might otherwise be lacking. Creative Bioscience notes that these improvements can lead to reductions in the rate of type II diabetes, heart disease, irritable bowel syndrome, and other chronic illness. Those who increase their intake of probiotic bacteria while following the Yogurt Diet may also notice improvements in bone health, notes Luque in The Yogurt Diet. In fact, an improved balance of intestinal flora can lead to increases in the rate of calcium absorption and transportation to the bones, says The Gloss, thus helping reduce rates of osteoporosis, and broken or fractured bones after a fall. Individuals who suffer from lactose intolerance should not follow the Yogurt Diet, recommends Luque, as they may notice an increase in gastrointestinal distress. Lactose intolerance is a condition in which the lactose found in certain dairy products, like yogurt, cannot be digested by the body. Dieters who have been diagnosed with diabetes mellitus should talk to their doctor before starting this eating style, notes Luque in The Yogurt Diet. 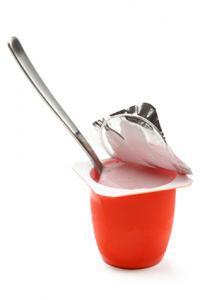 Yogurt - especially that which has added flavorings - contains sugar, which can cause blood glucose levels to increase. Luque notes that this is an eating plan - not a diet - and therefore, should be embraced as a permanent style of eating. In fact, the Yogurt Diet touts its compliance with recommendations made by the United States Department of Agriculture, and does, in fact, follow its guidelines for fruit, vegetable, grain, protein and dairy intake. With its numerous health benefits, it should come as no surprise that yogurt is often recommended for those who are interested in starting - and following - a balanced diet. In fact, the probiotics found in yogurt, including Lactobacillus acidophilus, Lactobacillus casei and Bifidus, are often touted as a must when it comes to improving digestive health, strengthening the immune system, and reducing the severity of certain illnesses. In addition, the protein, calcium and potassium found in yogurt makes it a must for those who want to improve and maintain their health. According to The Gloss, Greek God's Yogurt is specifically recommended for use when following the Yogurt Diet. Greek God's "Honey" yogurt contains 210 calories in one serving, has 10 grams of total fat, and 6 grams - or about 12 percent - of the percent daily value of protein recommended for adults each day. Those who eat four servings of Greek God's yogurt each day, then, could consume about 50 percent of their protein needs through yogurt alone. The Yogurt Diet is an eating style focused on a strong base of balanced nutrition and increase probiotics. Individuals who are interested in improving their weight, reducing rates of gastrointestinal distress, and preventing or managing certain chronic illness may experience success as a result of starting the Yogurt Diet. For optimal results, be sure to talk with your healthcare provider before starting this plan. He or she can tell you if you are healthy enough to incorporate this eating style.